As solid and advanced as the Retina IIc was yesterday, the Pony II is light and basic today. 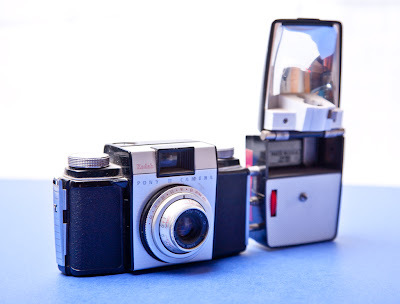 Shown above with an optional flash attached, this camera was manufactured between 1957 and 1962. It has a bakelite body with a simple viewfinder and takes 35mm film. Focus is set by estimating the distance to the subject and dialing in that value on the dial around the lens. The lens is marked as 44mm at f/3.9 but the aperture control ring is indexed with exposure values, not f/stops. An EV of 9 is wide open and 15 closes the four bladed diaphragm to its smallest opening, which looks to be about f/22. There is only a single shutter speed. I found a chart online that correlates exposure values/ISO to f/stops/shutter speeds. If I'm interpreting the chart correctly, I think the shutter speed is probably 1/30th or 1/60th of a second. This is a really basic camera which made a perfect gift when I received it around 2nd grade. That's right. This is my first camera. I thought it had been lost or given away in the moves growing up, but Dad had it stored away somewhere and here it was, all ready for me to pick up again and start making pictures. It's light and plastic, but simple. And that means there's not really much to go wrong with it. It seems to work as well now as it did when I first got it, more than a couple decades ago.